When I decided I wanted to go to Alaska this year as my big travel trip, I knew I wanted to check out breweries along the way. I researched breweries in Alaska and was pleasantly surprised to see that the craft beer movement had firmly found its way up north. Yay!! There are 22 breweries in the great state of Alaska. They are definitely not close together and some you can only access by boat or plane (which I don’t have!). Don’t think though that I am not trying to visit each and every one while I am here for the summer! One of the first ones I was able to visit was Glacier Brewhouse located in the heart of downtown Anchorage. It is considered a Brewpub which means their are limited on some of their distribution, have limited production bottle releases, but can easily do growler fills and produce an incredible number of kegs. They distribute all over Alaska and have started selling in Washington state as well. At Glacier Brewhouse, there are kegs of all sizes everywhere. Their cold storage is quite massive. 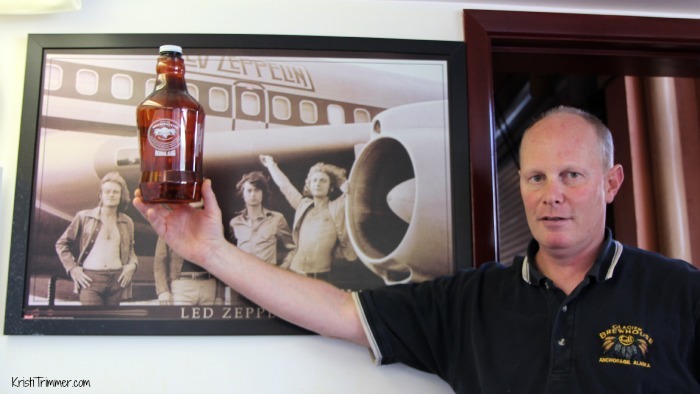 Head Brewer Kevin Burton holding up a new plastic growler next to one of his favorite bands, Led Zeppelin. Of course I asked Kevin what is favorite beer was that he brewed… well, not surprisingly it was their IPA. Their IPA counts for 40% of all beer production at Glacier Brewhouse. If he had to choose someone else’s? He likes a full one. Simple, really. I always like to know how a Head Brewer gives back to the newbies entering the industry. Kevin has mentored quite a few young brewers and is always willing to give advice on commercial brewing. His favorite saying to new home brewers is one that is quite true: It takes a lot of beer to make good beer. Pretty much, keep brewing and testing and tasting and then repeat. People are always in search of a good beer, give it to them. I have a thing for pics of kegs. And cans. And bottles. Ok, I have a thing for beer. There, I said it. Glacier Brewhouse has a pretty impressive barrel program. They call it the Wall of Wood and have a chilled vault underneath the floor of the brewery. They partner with Barrel Brokers in California and have different beers in various stages of conditioning in wine and whiskey oak barrels. At any one time there are 50 different speciality beers aging in the barrel room. I saw one that was being aged in Wild Turkey… seriously wonder what that will taste like. One of the most impressive things I learned about Glacier Brewhouse that made them really stand out in my mind was their 12 Days of Barleywine which is a huge celebration held each December. It starts on 12/10 and goes until Winter Solstice on 12/21, which is a really big celebration in Alaska. Barleywine is a complex beer to brew making it a hard one to perfect each year. One barrel takes a full year before it is ready to be debuted at the festival. During these 12 Days of Barleywine, Glacier Brewhouse showcases 40 different barleywines from their cellars over the years! I can’t even fathom this. I must come back to try their barleywines! Um, so who’s joining me in Alaska? In December. Pack a heated jacket! My favorite part of going to the different breweries is trying all of their beers, of course. I am not a huge IPA fan, but I did find theirs to be well balanced and I could definitely drink it. I can easily see why it is their most popular beer. 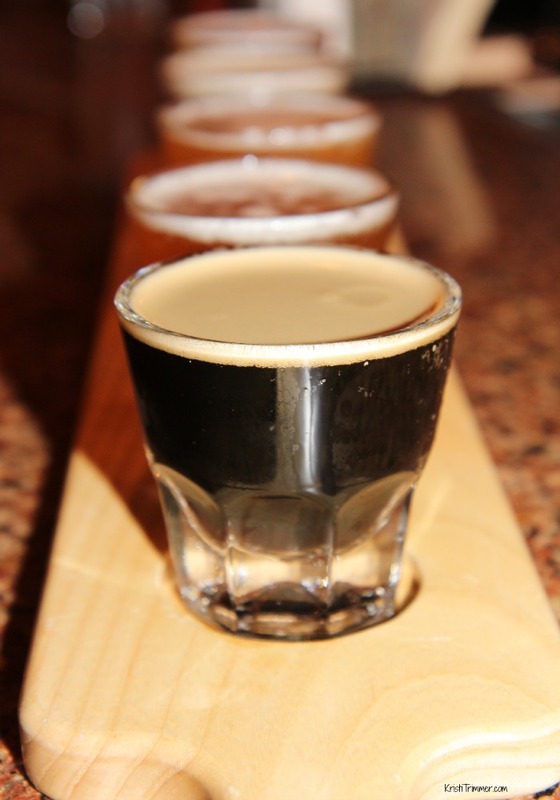 My top three faves though go to the Oatmeal Stout, Raspberry Wheat, and the incredibly impressive Black Rye Bock. The stout was deep, creamy, and had a lovely vanilla malty taste that I couldn’t get enough of. The Raspberry Wheat is definitely what I want in my growler on a hot summer day (they have just a few of those!). Now that Black Rye Bock sent me over the moon. It is mixed with their winter style lagers of Black Beer, Rye Beer, and Bock Beer – you gotta try it if you can get your hands on it! And yes, that Oatmeal Stout was Heaven in a glass. I know you were wondering. One of the best parts of sampling beers is sharing with those seated around me. There is no way I could drink all the beers that get poured for me. I met Rachel and her husband from Florida, and strangely we had a mutual friend in common. She too is a blogger and a runner and a lover of good craft beer – awesome. We became instant friends over sharing a brew together. That’s what beer is for! I spent a long time at Glacier and really found it to be outstanding. It has amazing food and the servers are ridiculously attentive. Glacier extended the invitation for me to have lunch with them. I happily obliged and had the Alaska Seafood Chowder – one of the best chowders I have had yet!! I then had their Chef’s special King Salmon dish. My first time eating King Salmon and I had to refrain myself from licking the plate. That good. Look at this presentation! 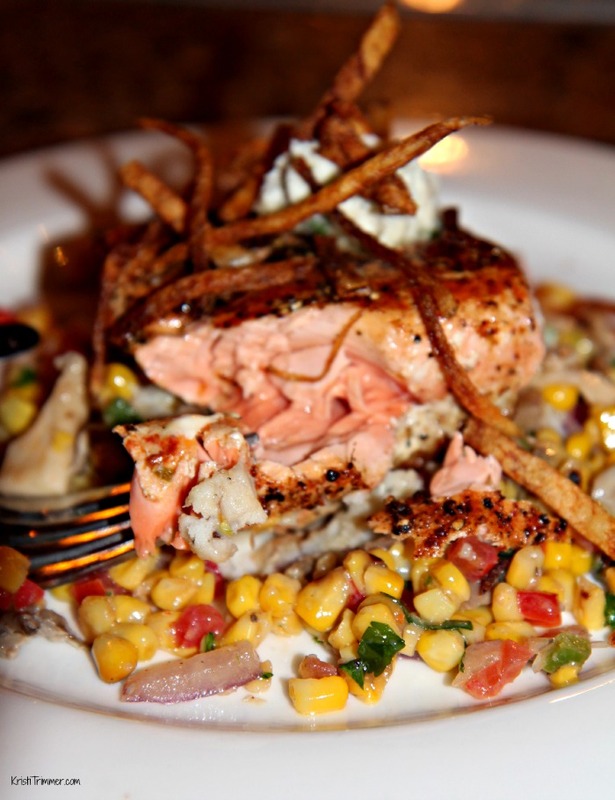 The salmon was moist and flaky and so full of flavor. Kinda hungry just thinking about it now. They wouldn’t let me leave until I tried their death by chocolate, I mean the Flourless Chocolate Tort… um, too delicious for words. Thank you Glacier Brewhouse for an awesome day hanging out in the brewery and sampling your beer. I can’t wait to go back and try more of your seasonal ales. I can see why you are one of the top breweries in Alaska! They sent me home with a growler of the Raspberry Wheat, which made me one happy camper. Disclosure: Glacier Brewhouse provided me with food, drinks, and lively conversation. That in no way clouded my judgement in loving their food and craft beers. They are doing a stellar job in the heart of Anchorage. Links within this post may contain affiliate links that I earn commissions from. Example, if you click on the above Craft Beer Club link and purchase anything from that site I make a small commission, no matter what you purchase. This is how I pay for my travels and this blog. Thank you for supporting me! « Divorce: Think Financially, Not Emotionally. I, too, loved the Black Rye Bock. And their cream soda was excellent, too, after I had had too much beer and needed a break. Looks like a nice place. My friend’s family was stationed in Anchorage for a couple of years – I wish I would have been able to have visited her when she was there. If you’re coming down to the Kenai Peninsula, give me a shout. I’ll hook you up with our local brewers. Bill – I will be back in under 2 weeks… would love to go beer tasting with you!